Does anyone know of the vivid racing turbo kit? - Miata Turbo Forum - Boost cars, acquire cats. Complete kits don't use regulators. They have aftermarket ECUs or they let you provide one. Regulators don't work right with our computers. I appreciate the feedback I really don't want to put something on my car that will blow it up. Is it possible to find a decent kit out there for about 3 grand? $3000 for a noob is hard. If you can up it to $4000 spread out a bit then you can build a good setup. $300 injectors. Buy flowforce injectors from tse and call it a day. $350-450 for a clutch. I only reccomend FM or ACT for these. $400 for intercooler, piping, and bov. Then you have a little $1500 to do manifold, turbo, downpipe, exhaust. Also budget $500 for misc **** that you missed getting earlier. oh i remember that thing. i wanna say AVO but i dont think it's correct. what a piece of junk. no slightly different, hmmm, i know ive seen that before though, maybe back in 2007 a member here tried to get that to work. I remembered in bed last last. It used to be called turbo specialties. 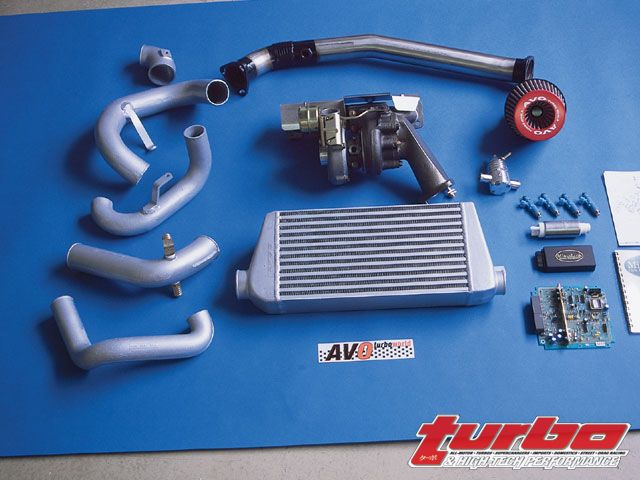 a member here (UrbanSoot) bought it, had issues installing it, and the turbo was smaller than a GT2554 -- IIRC the GT2052. he spent way too much on it, and sold it soon after installation. With the options available today, I'd never consider this kit in a million years. if you spend $2,600 on that kit you're a ******* moron. The AVO kit had limited run in the US by racing beat (I think) and Performance Buyers Club (PBC Auto) around 2001. FM had signed an exclusive deal with corky bell and Bell cancelled all Aerodyne orders with PBC. I was at PBC at the time and my 91 was the guinea pig for the AVO kit. The kit ran but was junk. It had a fifth injector setup that was garbage, the compressor outlet ran through the PS so that came out, the intercooler outlet pipe hit any upgraded sway bar, no blow off valve, you get the idea. Avoid anything similar at all costs. Vivid Racing is up the street from me. Most of the people in the local car scene **** on them. It's well deserved. Don't give them your money. My friend has what i assume is a later model AVO kit on his car. Other than the **** downpipe it is an OK kit. Has a ball bearing T28 on it which is good. However his did not use the 5th injector and had been running on a link for years. His car is actually the old Enthuza car. Not sure who built it before it got the owner of Enthuza at the time. AVO was marketed and sold by Cam Pettit, who was somewhat known in the FD3 arena but unknown to Miata enthusiasts. You could also call Terry at AVO directly, and he would drop a kit on an airplane if you could bring it through customs yourself (surprisingly easy). AVO had the fifth injector as an option, but they also sold without electronics (hardware only). In non-US markets, they used a Link, same as FM EXCEPT FM had exclusivity which is why AVO Terry wouldn't sell that option in USA. AVO uses the same Garrett as everyone else, just tell them what you want. The only downside was the turbo was mounted pretty far back, and the elbow from the turbo to the downpipe was pretty restricted. The ones I have seen certainly came with blow-off valve and other critical parts (IIRC a pretty nice BOV). IIRC AVO has (or is working on) an ND option. They certainly have many other turbo kits besides Miatas, and I would expect them to be same quality. I would steer away from the downpipe (bad design), but the hardware seemed quite reasonable quality. So the 1.6 Kits were not that nice, and this was a circa 2001 timeline for the original kits. That kit shows the power steering issue I had, and as M2Ken noted, the rear downpipe was quite restricted. At the time, the 1.6's brought in to the states had no BOV, 5th injector and little accomodation for the oil return. The alignment between the standard drain location and the turbo was not good. The 5th injector was junk, but I did make 150HP at 8psi, which wasn't bad for the time/setup. If I remember right, we talked to AVO about this and they offered to send someone over if we would pay the plane ticket/room/board for someone to come to the US, take measurements and then go home to design new parts that they would sell to us at cost. We declined and chose to just resell BEGI kits by buying through FM. the fitment with power steering and all was fine on this car before i removed it and depowered the rack. the IC pipes on this one are cast aluminum unlike the ones in that picture. i plan on making a new downpipe for this one eventually when he wants to turn up the boost. This is currently making 200whp and 200wtq. Damn, that was some shitting routing by them. Quick Reply: Does anyone know of the vivid racing turbo kit?